Richard D. Rus­sell will have three pieces per­formed on Octo­ber 24, 2010 at the Bell and Barter The­ater in Rock­away, NJ. Details are on the poster, please click for a larger view. 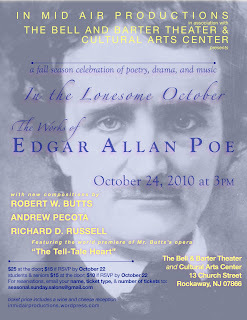 All of the day’s pieces will have a theme tied in with Edgar Allan Poe. Russell’s com­po­si­tions include “A Poe Fan­ta­sia” plus two new pre­mieres: “Eldo­rado” and “Annabel Lee” both for voice and piano trio. Tick­ets at the door are $25, so save $10 by reg­is­ter­ing early! A wine and cheese recep­tion is included in the ticket’s cost.